The second annual Best of New England Wine Competition took place here on April 25th, with six judges including grape and fruit wine and cider and mead specialists, tasting dozens of entries from New England states resulting in 42 medals; two Double Gold, nine Gold, 13 Silver and 17 Bronze medals. The competition took place in Charlottesville, VA to ensure judges would not recognize the wines. Judges were: Dr. Joseph Fiola, an enologist and Small Fruit Specialist at the University of Western Maryland; Michael Fairbrother of Moonlight Meadery in Londonderry, NH; Christine Iezzi of Country Vintner, a mid-Atlantic wine distributor; Matthieu Finot of King Family Vineyards, a leading Virginia winemaker; and Todd Trazkos of Vermont Wine Media. Best of State awards went to the following: for Connecticut, Sunset Meadow Vineyards for their “SMV Enchanted Apple”; for Maine, Winterport Winery for their “Crackling Cranberry”; for New Hampshire, Hermit Woods Winery for their “Petite Blue”; for Rhode Island, Greenvale Vineyards for their 2012 Cabernet Franc; and for Vermont, Shelburne Vineyards for their Marquette Reserve 2015 (there was no “Best of State” qualifier for Massachusetts). The Best of New England Wine Competition is dedicated to showcasing the best of 100% New England grape and fruit wines, mead, cider and eaux-de-vie, as being of high quality, diverse, food-friendly in the Old World style and worthy of pairing with fine New England-sourced cuisine. Complete competition results are posted at www.bestofnewenglandwine.com. Forge Cellars in the Finger Lakes released their first vintage in 2011. The impresive trio that produces the wines includes Louis Barruol, Rick Rainey and Justin Boyette. Barroul is the famous winemaker. "Louis comes from a winemaking tradition of 14 generations. His family has been located at their historic property in the village of Gigondas in the Southern Rhone Valley of France since 1570. Louis grew up among the vines and took over the estate from his dad in 1992, proceeding to improve quality and grow a vigneron-negociant arm of the business. Chateau de St. Cosme is now regarded as the benchmark of wine quality in Gigondas." Rainy is in charge of the Vineyards and General Manager - "Originally a Florida boy, Rick came to the Finger Lakes by way of Philadelphia twenty years ago with the aim of owning a winery. During the past nearly two decades, he has been selling and buying wine (mostly French) for an international, fine wine distributor-importer. With Forge Cellars, it seems that Rick has finally come full circle and gotten to dig his hands into the dirt." Justin Boyette is the steady hand that oversees winemaking on a day-to-day basis. "Winemaker, Steady Hand - Justin works diligently with Louis to make the Forge wines, handling all day-to-day winemaking and élevage with Assistant Winemaker, Alexandra. He is the co-owner of another winery on the east side of Seneca Lake called Hector Wine Company and before that, held winemaking positions at Red Newt Cellars, Atwater Estate Vineyards and Poplar Ridge Vineyards." I tried the wines at the Hector Wine Company while I was in the Finger Lakes last. I had heard a lot about them. Great reviews for their Pinot Noirs, Rieslings, etc. They've even released some oak aged Rielsings. You have to like what you hear about Forge Cellars. THE ALLIES, THE FRIENDS, THE UNITED ONES. - This is small batch fermentation and winemaking at it's boutique best. According to the owners, "Every year Les Alliés evolves naturally by “uncovering” itself. Our indigenous yeast fermentations proceed very slowly. It’s not in spring, but in the summer after the vintage that we are finally able to move toward bottling the wines. Once fermentations are complete, our team begins diligently tasting through our barrels and tanks, giving each a detailed rating and review, and writing personal tasting notes. When we talk about small batch and individualized fermentations, we really mean it — hundreds of separate, small French barriques from 15 individual vineyards, each with its own story and personality. Along the way, we decide that some very special barrels are stand-outs, and by consensus, the most exceptional of our Rieslings and Pinots. This is the consensus that makes up Les Alliés — the allies, the partners, the united ones. We don’t “make” Les Alliés, we discover it together, and it’s an easy decision because it tells us what it wants to be." I tried the Forge Les Allies Riesling 2014. the grapes for this wine come from the east side of Seneca Lake. This is a bog, flowery expression of riesling bursting with tropical fruit, Lychee, and passionfruit and green apple and hints of petrol. A lovely, refreshing white with zippy acidity and impressive structure. The flavor of this wine lingers on the palate for some time. Then I tasted the Forge Cellars Les Allies Pinot Noir 2014. The grapes are from the east side of Seneca Lake. Stewed plums and blackberries come through as promised as well as hints of lavender, blueberry, and a lot of spice and black pepper. There is an earthiness that comes about....bramble? This is an elegant, complex, impressive wine. Really, an amazing Pinot Noir. I am absolutely late to this party. These folks have been gathering up accolades and plaudits all over the place from Wine Spectator to the Cork Report. Barroul, Rainy and Boyette have crafted an absolutely exquisite line of fine quality wines! The Lucky Hare Brewing Company opened on May 20th, 2016 in Hector, NY in the heart of Finger Lakes Wine Country. The owners had their 100 year old barn converted into a 3 barrel brewery outfitted with all Stout Tanks and Kettles. Annual production is approximately 350 barrels of beer. Lucky Hare corporate president is Richard Thiel. Head brewer and company vice president is Ian Conboy, Thiel's stepson. "Ian put every penny he had into the company," Thiel told Will Cleveland of the Democrat & Chronicle. The brewery recently was approved for a grant to expand it's operations. So the business after about 2 years id doing well! I went with several friends, including my long time drinking companion Rich Srsich. I had the Cezanne, their sour beer. We had one each, the Millennial Falcon, the Blonde Moment, and the Two Can Sam. All the beers were good. Two Can Slam / Pale Wheat (5.5% ABV / 24 IBUs) is a citrusy ale with notes of lemongrass, and passion fruit. It's a hoppy, white wheat ale that's pretty damn good. The other I recall fondly was the Millenial Falcon / DIPA (8.6% ABV / 101.8 IBUs) a/k/a Falcon Punch x2 is made with Maris Otter and Flaked Oats. This is a dry hoppped ale that explodes with grass note all over the place. Super refreshing. I used to think I knew lot about New Jersey wine. And for many years, I did. Even as many wine writers scoffed, I fought the good fight to promote quality focused New Jersey wine. While my fortunes took me elsewhere, I continued to try to fight the good fight, but I was also touting the charms and artisanal products of my adopted state of New York. Hard to devote your heart to both. Enter John Cifelli. He is without question the new Pinball Wizard and has been for the last five or seven years. He is doing everything he can. I first met John I think when he was with the Garden State Winemakers Association, where he did a terrific job. He is currently the General Manager at Unionville Vineyards and the spokesperson for the Winemaker's Co-op. And in a stroke of good luck for New Jersey, he is the most vocal advocate of quality wine in the Garden State, and has been for some time. And he's doing a great job of it. Here's John's bio from the Unionville Vineyards website: John is a 15 year veteran of the New Jersey food, beverage, and hospitality industries. John combines his passions for world-class hospitality and fine wines to define Unionville as a benchmark for East Coast wine production. John held management roles at New Jersey dining landmarks The Stockton Inn and Blue Morel. John is on his second tour of duty at Unionville, with a two year stint as the Executive Director of the Garden State Wine Growers Association in between. 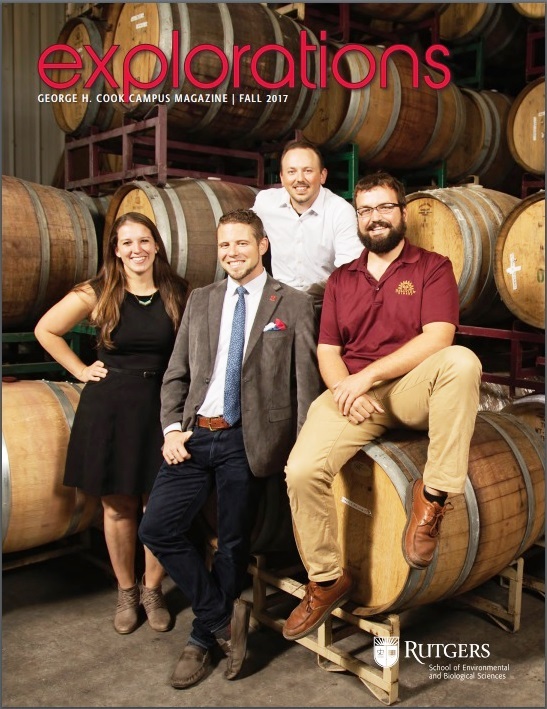 Besides focusing on business development, marketing, and guest experience at Unionville, John also currently serves as the Executive Director of The Winemakers Co-Op. John is a certified sommelier through the Court of Master Sommeliers, and hosts a monthly wine tasting club at the winery. He lives in Hunterdon County with his family of ardent Rutgers Scarlet Knights. Here's a photo taken at a tasting that wine writer Lenn Thompson and I attended of The Winemaker's Co-Op. John has done a great job getting these quality wines noticed. John is a whiz kid from Rutgers agricultural and enology program. For those of you who don't know, the Winemaker's Co-op was created by four New Jersey wineries to promote the fine wine movement in the Garden State. The goal is to highlight and encourage premium New Jersey wine production with exclusive events, press outreach, and industry investment. Founding wineries Beneduce Vineyards (Pittstown), Heritage Vineyards (Mullica Hill), Unionville Vineyards (Ringoes), and Working Dog Winery (East Windsor) are dedicated to encouraging the movement for fine wines in the Garden State. We hope that you will join us in celebrating this exciting venture at a crucial moment for the New Jersey wine industry. John is the person who gave us the tour, and explained the new landscape of New Jersey wine. There are many other good quality producers that aren't part of the co-op but this is an exceptional first step in promoting quality wine in the state. Every state or region needs such as person. Glad to see NJ has one of the good ones. John has done a great deal as a regional wine promoter and deserves the kudos! Go John! There are several new quality producers rising in the Hudson Valley. One of the most notable is Milea Vineyards. I have been drinking and posting about Milea for more than a year now on places like Facebook but I think it''s time I gave them some much more serious, overdue love. Milea Estate Vineyard is located in Staatsburg, NY, in the Hudson Valley, approximately 80 miles north of New York City. Staatsburg is nearest it' more famous neighbor, Hyde Park, in the rolling back country of Dutchess County, in the mid valley. They are situated far enough south that they can grow many verities. In 1984, Barry Milea and his father bought part of the Rymph Family Farm, a property that Barry fell in love with and dreamed of returning to its farming origins. In the summer of 2015, after years of research and experimentation with the land, Barry Milea, Ed Evans, and Bruce Tripp formed Milea Estate Vineyard. The first crush in autumn of 2015 resulted in award-winning wines, and Barry added adjoining land to the property in early 2016 for a 98-acre estate. I've known winemaker Bruce Tripp a long time. He works very hard to over see the wines-in-process meetings that take place in the Hudson Valley where the valley's winemakers can share their wines, and discuss faults, solutions, and share information, techniques, products, and processes. He has been an important part of the valley's growth over the last half decade. A former law enforcement officer, Ed is one of the nicest guys in the valley. He is passionate about wine and learning about wine. Helpful. Always looking to learn and share information. He's the real deal. We love Ed! Now,let's talk about Milea Wines. The first up is the Milea Estate Vineyard Chardonnay 2015.This was a stainless steel Chardonnay, with lots of green apple and tropical fruits, a touch of minerality, with hints of apricot, vanilla, and lemon zest. Charming and elegant, light and flavorful, this was an exceptional rendering of Hudson Valley and east coast chardonnay. One of the better east coast chardonnays. The Milea Estate Vineyard Reserve Chardonnay 2016 was another excellent addition to east coast chardonnay making. This wine was made in stainless steel then aged in new lightly toasted French oak. This wine had ripe red apples and ripe succulent pears, more subdued tropical notes, but with more vanilla, lemon zest, but with a creamy finish. Exceptional. Milea Estate Vineyard Traminette 2016 was a lovely, aromatic, elegant floral white wine bursting with apricot, tangerine, and trpical fflavors, as well as a little green apple. A lovely, zesty, acidic ending makes this wine pop. One of the better Traminettes I have had. The Milea Estate Vineyard Pinot Noir 2015 was a glass of bright and dark ripe cherries, with hints of plum and some floral notes, including violets, with a nice thin layer of vanilla. A beautiful cool climate Pinot Noir! Loved, loved, loved the Milea Estate Vineyard Late Harvest Vignoles 2015. This late harvested Vignoles was grown by a special friend of the vineyard, Tom Mitchell who unfortunately passed away soon after the harvest. According to the websie, "Tom worked wonders in the vineyard to coax and concentrate the racy tropical flavors in this special wine." Whatever Tom did, it worked! Sweet notes of honey, apricot, peaches, honeysuckle, and orange blossom were whipped up into an ambrosia that still had a nice dollop of acidity at the end to keep this wine tasting fresh and honest. Absolutely lovely! I have tasted two seasons of Milea's growing wine list, and so far it has been one of the most amazing debuts of any east coast winery. The quality is there! And the taste is sensational. A great new addition to the Hudson Valley, to New York state, and east coast winemaking!! Congrats folks! So I was traveling to Washington DC with a good friend of mine, David Falcheck, and we decided on planning our trip to stop somewhere along the way and visit a winery or two. David is the Executive Director at American Wine Society. He had never been to one of my favorite haunts - VaLa Vineyards! I texted the incredibly gifted Anthony Vietri, and asked him if we could stop by, since it was a day they were normally closed. He was incredibly gracious as always! Anthony is a growing figure on the east coast wine scene. He is hermit like, in that he rarely eaves the confines of his vineyards at VaLa, in southern Pennsylvania, and he rarely travels outside of his large family circle. Yet, he is a gardener and viticulturalist extraordinare! All of Anthony's wines are blends, and almost all are Northern Italian varieties. Anthony's family has been in the United States for more than a century, and his roots are on display at the winery. The first wine we tasted with local cheese and honey was the amber-hued 2013 La Prima Donna white wine. It comes in at a whopping 14.4% alcohol, and you barely taste the alcohol. It is a blend of tocai, malvasia bianca, fiano, pinot grigio, petit manseng. This rich, layered, textured white wine has dried apricot and peaches, fresh apple, and hints of pineapple an tropical fruits. The vines are 18 years old, and the wine is aged 17 months on the skins (sulle bucce in Italian, i.e sur lies). It's done in small batches, then blended, and was bottle aged for 10 months before release. An incredible wine. The next wine was the 2015 SILK with an alcohol of 14.5%. Silk is a dark rosato made from corvina veronese, barbera, nebbiolo, carmine, petit verdot, etc. It is the color of a dark rose or a light pinot noir. It is filled with flavor and richness usually not accustomed to the category. Bright raspberry, cherry, and fresh blackberry offset lovely notes of cedar and dark wood. Lovely for tuna steak, poultry, pork chops or salad, this is the perfect lunch wine. This wine is what lazy afternoons in summer were made for. Wonderful. The 2015 VaLa Castana is a blend medium bodied red, a resulting blend of Barbera, Carmine, and Petit Verdot, etc. It is an immensely impressive wine with a combination of light and dark fruit. Highlights include young raspberries and bing cherry, alternating with a brambly dark blackberry, tinged with wood and vanilla. An impressive red wine for any region, Castana is among my favorites. Anthony was very generous and treated us to a bowlful of his mother's sauce. OMG was this incredible. With the cheese and the light pasta and the wine, it felt like a sunny day in Tuscany! Then came the grandaddy of all east coast wine, Mahogany. It is hard to prepare someone for what their first taste of Mahogany will be. If there was a First Growth classification of the east coast, VaLa Mahogany would asbolutely be on it! This 2015 VaLa Mahogany did not disappoint. This rich wine, dar in color, with notes of dark cherry, dark raspberry and bramble, is the reuslting blend of malvasia nera, barbera, sagrantino, carmine, lagrein, charbono, teroldego, petit verdot. This wine is absoluetly one of the best Italian reds you will ever drink! Astounding! As you can imagine, David was an immediate convert. Anyone I have ever sent there usually is. Always sad to leave VaLa, but always satisfied and thrilled at the experience! YOU MUST GO TO VaLa! Wiggly Bridge Small Barrel Bourbon is one of my favorite bourbons. And hint, hint, it's not from Kentucky - it made in Maine! I've been drinking Wiggly Bridge for almost a year now. I've drank Scotches, bourbons, Tennessee whiskies - and I am here to tell you that Wiggly bridge is making some righteous hootch in York, Maine. And that their bourbon stands apar - and together made with anything other bourbon you'll have. The business is own by David Woods and David Woods Jr. Wiggly Bridge Distillery is family owned and operated. David Woods has always been self-employed, an has owned a hand full of business ventures. When he’s not distilling or stopping in at the other businesses, David enjoys spending time with his kids and six grandchildren. Young David Woods (aka "Little David") has been part of the family business since a young age, and he is a jack of all trades. David is a self-taught welder who makes coppers stills. Wiggly bridge is a small batch distillery committed to making quality stuff. They make a white whiskey, a small barrel bourbon, small barrel rum, a white rum, a vodka and a small batch dry gin. Their lineup is solid throughout. But the bourbon to me shines through! It starts off with sweet corn, cereal, caramel and honey, oak, and dried fruit (dates, figs, apple and pear), and has hints of sweet tobacco and a lovely vanilla touch. Who knew? It's a little taste of Kentucky in York, Maine! This is a wonderful whiskey! Buy it!!! !